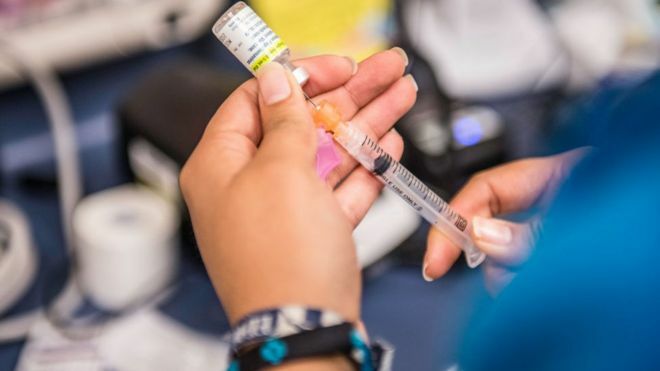 The U.K.’s National Health Service (NHS) launched a program in 2009 that offers 12- and 13-year-old girls the vaccine against the human papillomavirus (HPV), a group of sexually transmitted viruses that could lead to cervical cancer. Scientists from Strathclyde, Edinburgh, Aberdeen and Glasgow Caledonian universities teamed up to analyze the cervical cancer screenings and vaccination records for 138,692 women who received their first screen for cervical cancer at the age of 20 between 2008 and 2016. Cervical cancer is the second most common type of cancer for women under the age of 35 in the U.K., the NHS reported. While there are over 100 kinds of HPV, some strains of the virus are considered high risk because of their link to cervical cancer. Researchers evaluated the level of abnormal cells, called cervical intraepithelial neoplasia (CIN), found in each woman’s first screening. The NHS categorizes CIN in three levels with CIN 1 cells having the lowest risk of becoming cancerous, CIN 2 have a moderate risk and CIN 3 cells having the highest risk. The study revealed that vaccinated women born in 1995 and 1996 experienced an 89 percent reduction in CIN 3 cells compared to women born in 1988 who never were administered the vaccine. The researchers also found an 88 percent reduction in CIN 2 cells and a 79 percent reduction in CIN 1 cells, The Independent reported. When the NHS first launched the vaccination program, scientists originally believed the vaccine would protect against only two strains of HPV, the ones responsible for 80 percent of precancerous conditions, reported BBC News. Research now suggests the HPV vaccination protects against three additional strains of the virus, eliminating 90 percent of pre-invasive cervical disease in Scotland.